How does the solar energy work ? Solar energy is an endless, renewable source. Solar energy is created by harnessing the sun's light and heat by capturing them through solar panels. Solar energy accounts for the majority of renewable energy, however only a fraction of the available energy is being used. Solar energy can be adapted to fuel houses, offices, schools, cars, and many more. There are two methods of harnessing solar energy. One focuses on gathering thermal energy and the other focuses on light energy. 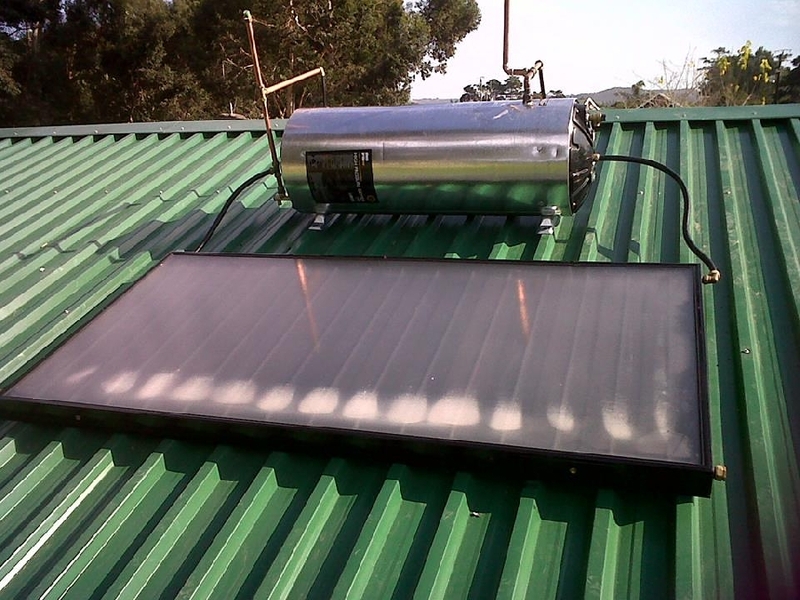 A solar water heating system consists of two main components; a solar collector (or panel) and a storage tank. 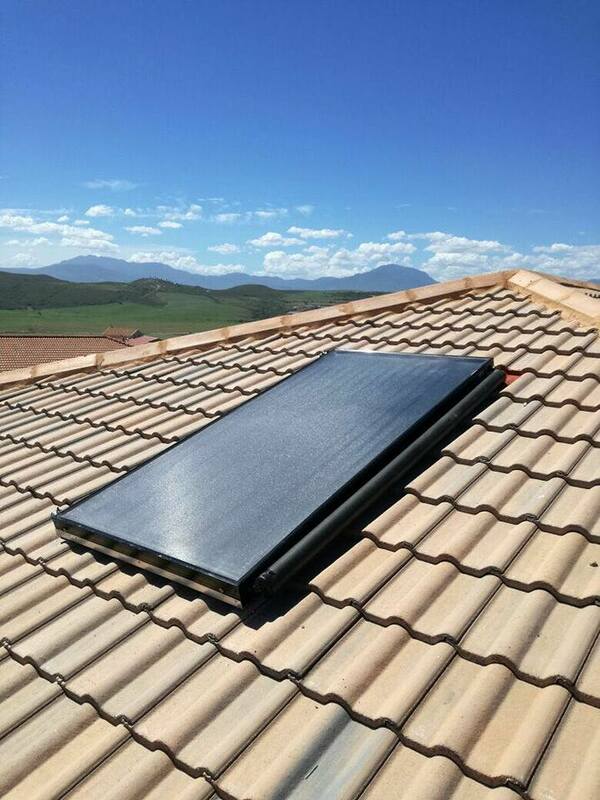 The collector is a glass-glazed, insulated plate that is painted a dark colour for maximum light absorption. 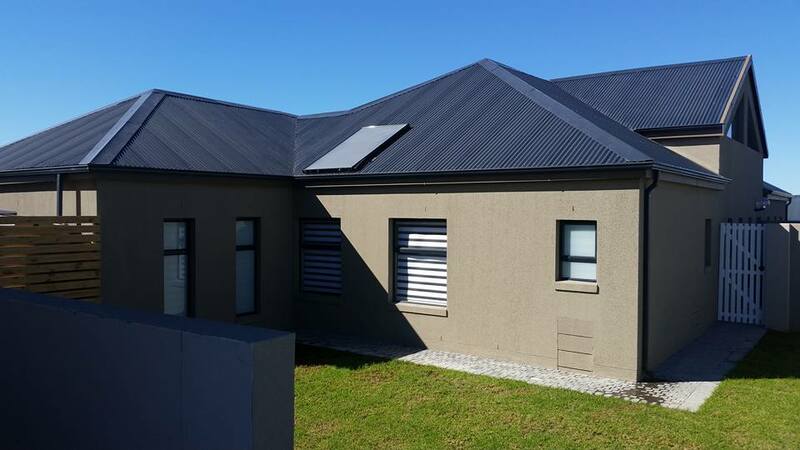 Collectors can be fixed onto any roof type, be it angled or flat. Inside the collector run a series of pipes for the transportation of water / other fluids (depending on the type of system you have, see the difference between direct and in-direct here. 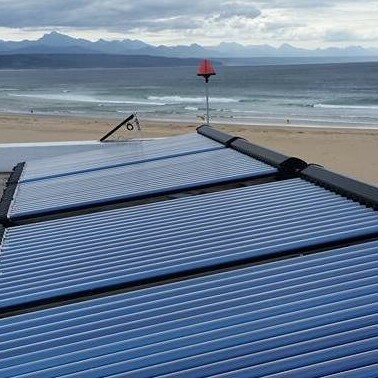 The solar collector turns the sun’s energy into heat. This heat is then transferred via the pipes to the storage tank where the water is held. 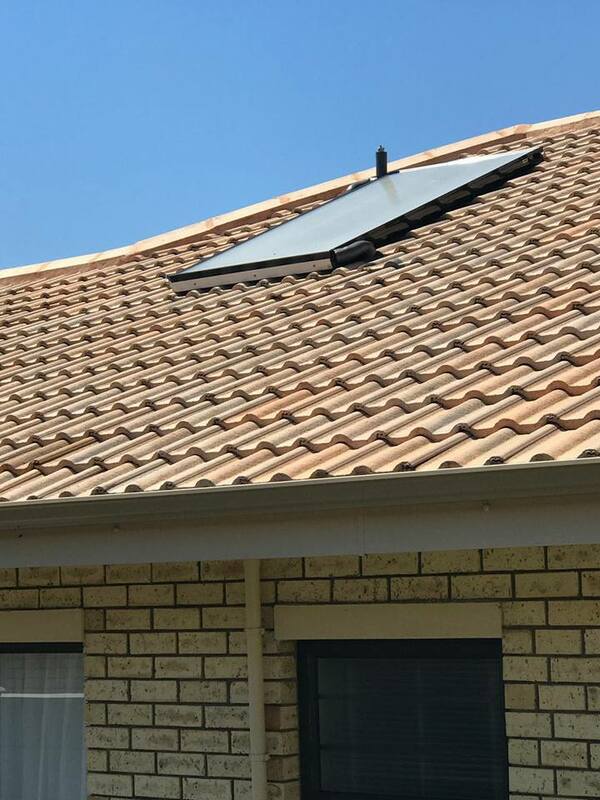 Our tanks are usually positioned above the collectors to allow the heat to move by convection (otherwise known as a Thermosiphon system) but can be placed in any position desired with the addition a pump to move the water. The hard truth is that electricity costs have been rising endlessly and are set to continue rising by an average of 25% per annum. 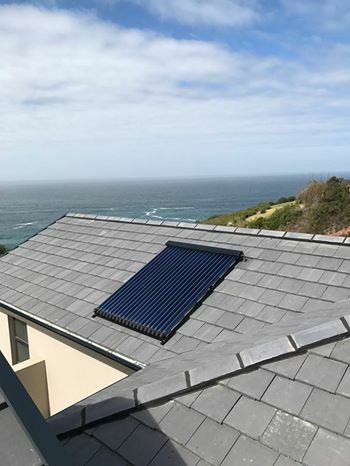 As your geyser’s consumption can account for up to 60% of your monthly electricity bill, solar water heating is an extremely effective means of drastically reducing electricity costs with savings to be seen and enjoyed from day one. 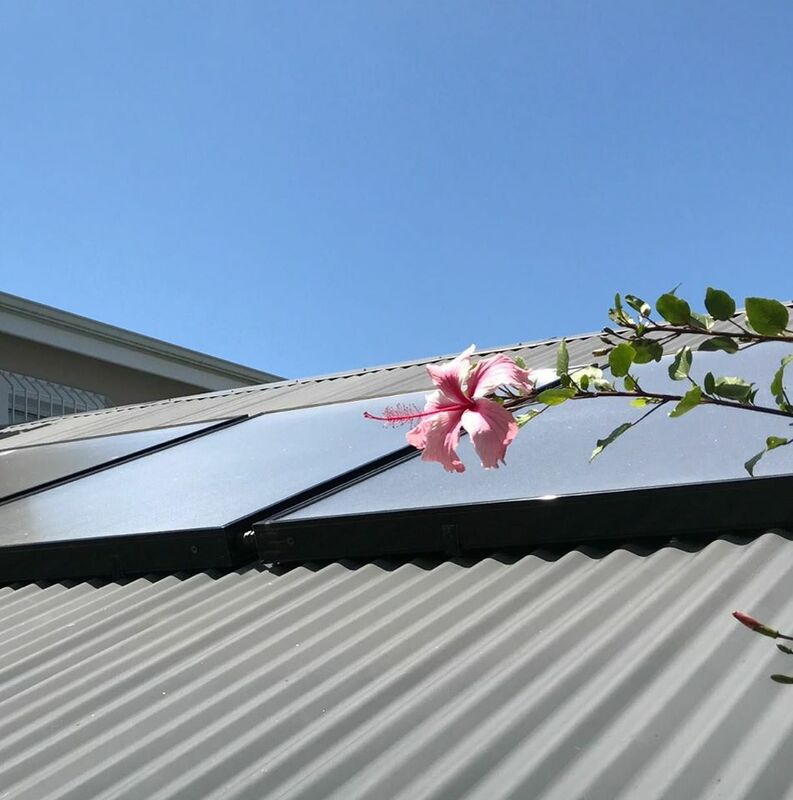 Solar Solutions makes switching to solar heated water easy and affordable. 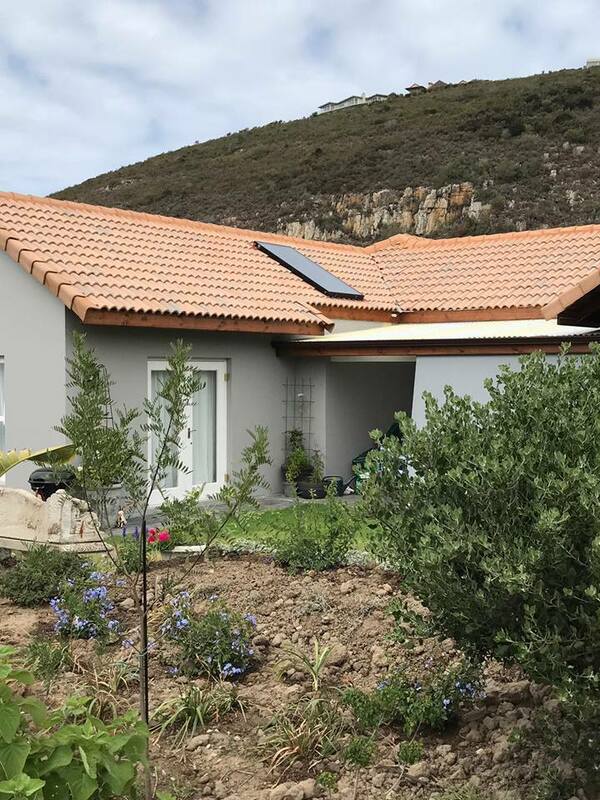 Invest in Green energy for your home and do good for the environment and your children’s generation. 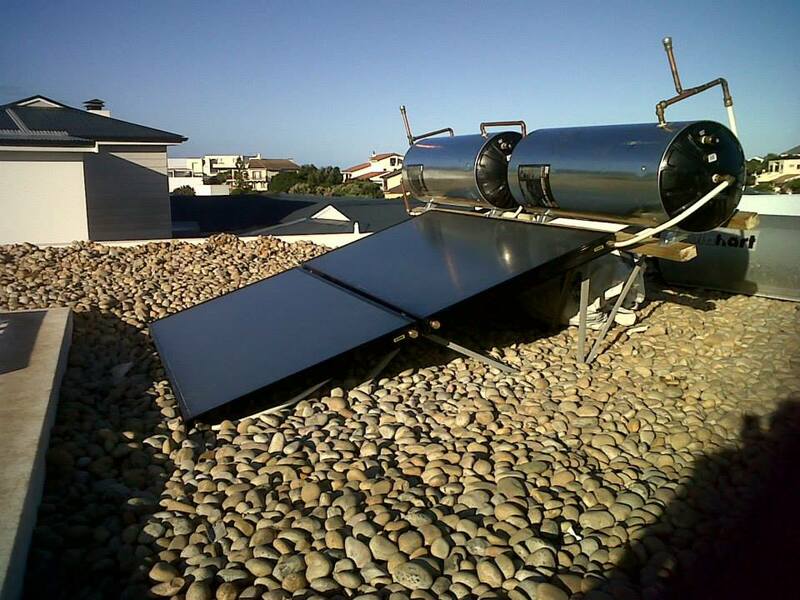 Increase the value of your property by installing a solar water heating system. Power cuts will hardly affect your hot water needs. All of our systems carry a 5 year warrantee on the collector and tank. These are the most common systems on the market. 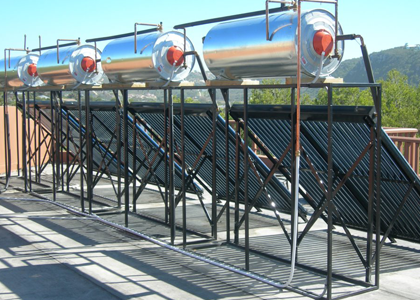 It consists of roof-mounted solar collectors, combined with a horizontally-mounted storage tank located immediately above these collectors. In most close coupled systems a pump is not required. 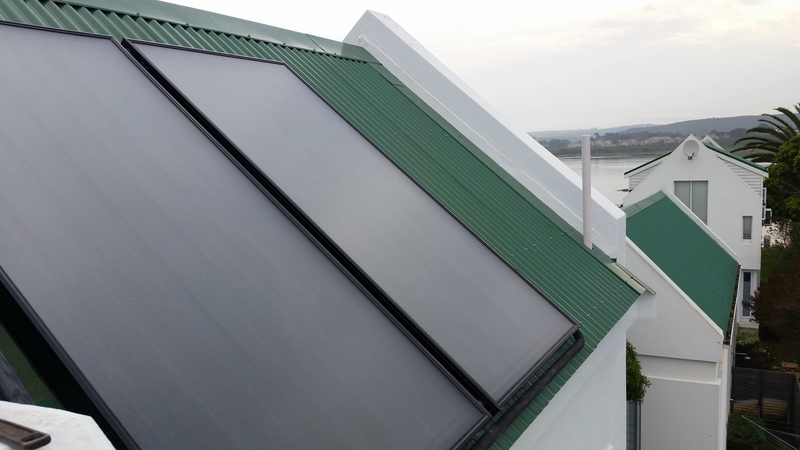 Heated water rises naturally through the solar collectors and enters the storage tank. When this happens, cooler water at the base of the storage tank is forced out and flows down to the bottom of the collectors. This cycle is continuously repeated while the sun is shining. 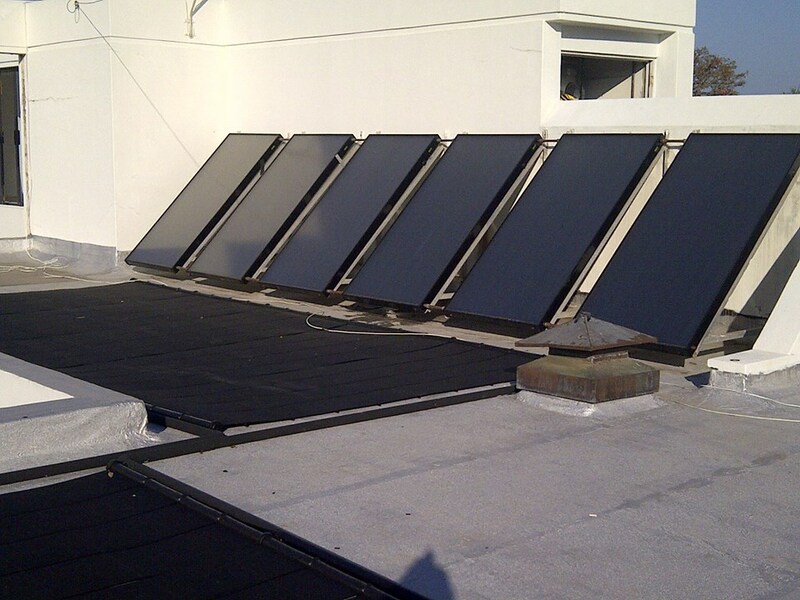 Most commercially available solar hot water systems employ this cycle, commonly referred to as ‘thermosyphon flow'. 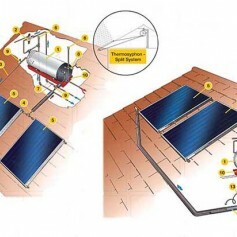 This system works on the same principle as the close-coupled thermosyphon system, except that the storage tank is located within the roof space . The base of the tank must be situated at least 300 mm above the collectors. The tank is located below the level of the collectors, usually at ground level. Water must therefore be pumped from the tank to the collectors and back by a thermostatically controlled pump. Pumps are not expensive to run, costing between one and two cents per hour. This system can be used when the roof structure isn't strong enough to support a close-coupled system. The system is traditionally boosted by off-peak electricity. 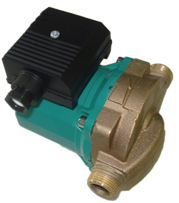 Pumps can be mains or photovoltaically driven. 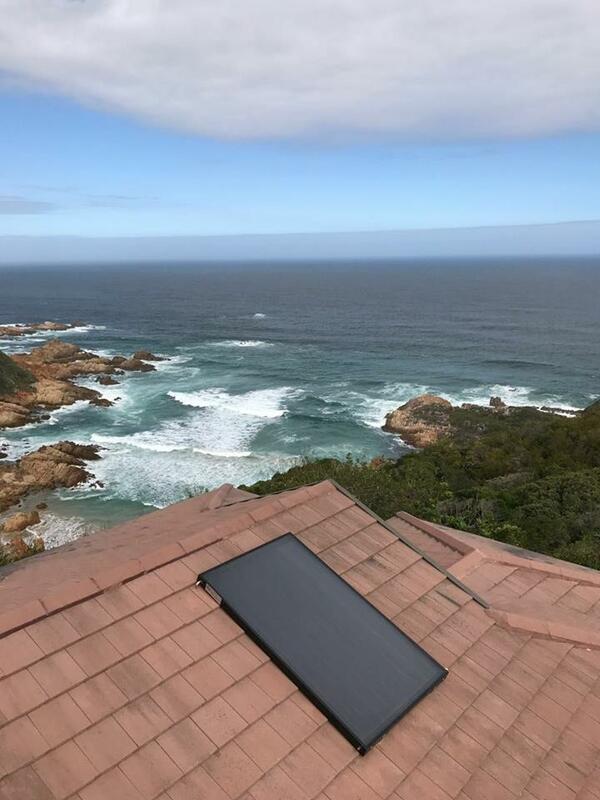 With the Solar Solutions split system the only thing visible on the roof is the flat plate or evacuated tube collector panels. Ideal when the home owner prefers the tank not to be visible on the roof. The storage cylinder can be mounted at any desired location. Depending on the location of the cylinder, pumps and controllers may be required to regulate the flow of water between the cylinder and the collector. 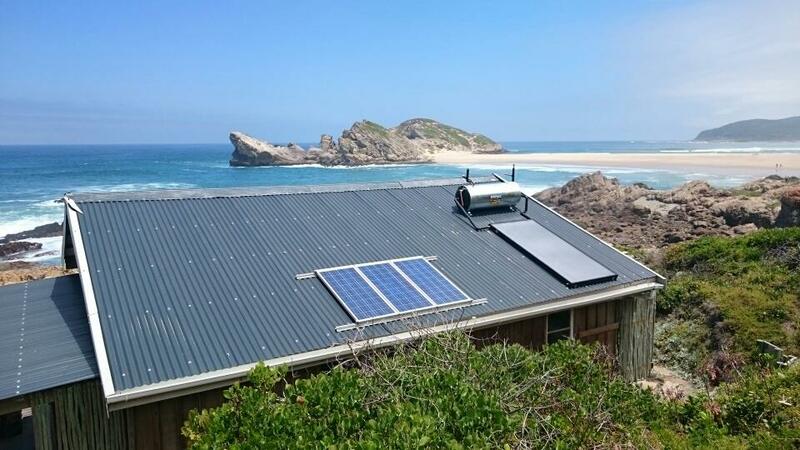 An electric backup element cuts in on those days when the sun refuses to shine, so there is always plenty of hot water on tap, no matter what the conditions. 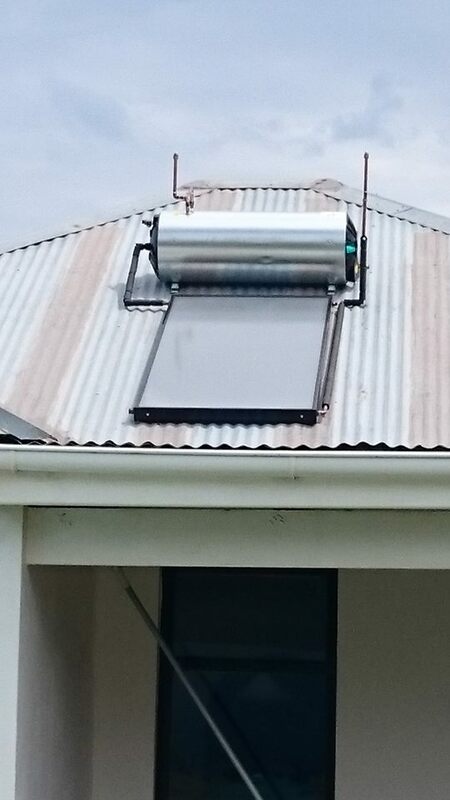 For solar system loops, the SID can be powered directly from a PV panel. 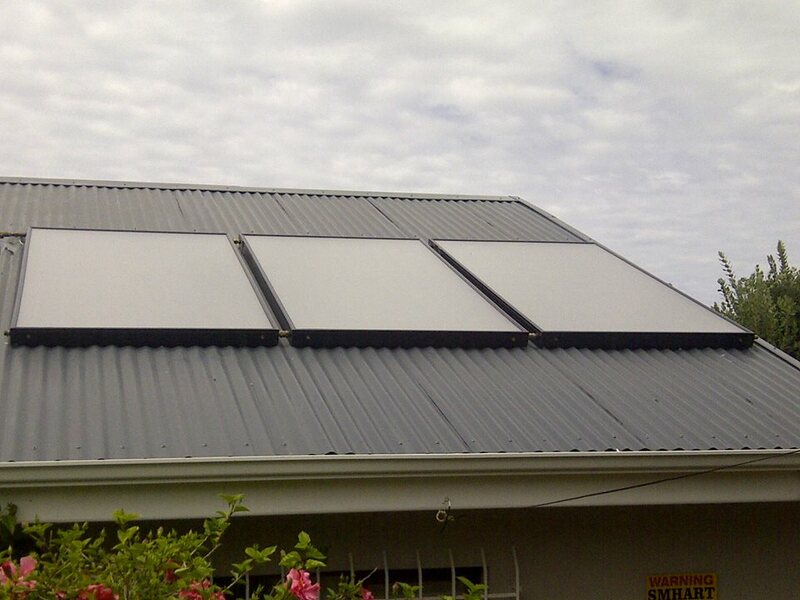 The sun comes up, heat bulds in the solar hot water panel and at the same time electricity is made in the PV panel. The pump slowly starts with the smallest amount of current and pushes the heated water to the storage tank. It's all too simple and eliminates all controllers, thermostats and sensors. The EL SID pumps have no seals which can leak, and no bearings to get hot brushes to spark - they are explosion proof. This pump is used to circulate the water throughout the solar collctor or other hot water heat emitting system. The pumps are circulating, and are best for circulating, and are best for circulating water in a closed-loop system, such as heating or solar. As for anything else, their use is as unlimited as your imagination. Keep in mind they'll pump water, as well as antifreeze and various other chemicals. With GeyserwiseMax, you start to save electricity and money immediately! Between 40% and 60% of your electricity bill is often calculated as the geyser costs. With Geyserwise you can save up to 70% of the geyser costs on your electricity bill!